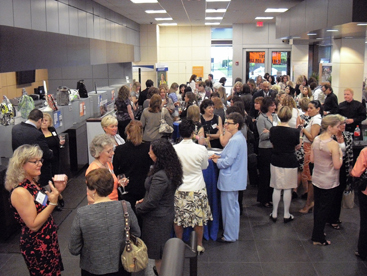 BY, FOR, AND ABOUT WOMEN: The Princeton Regional Chamber of Commerce kicked off its new Women in Business Alliance May 25 with a reception at PNC Bank on Nassau Street. The featured speaker was Terry Adams of the Adams Consulting Group, who spoke to the more than 100 in attendance about the different ways men and women behave in business situations. Men speak one way; women speak another. Males of the species miss verbal cues; females pick up on them. These key differences in behavior were among several cited by speaker Terry Adams in Mars & Venus: Bridging the Communication Gap, a talk held at the opening event of the Princeton Regional Chamber of Commerces Women in Business Alliance on May 25. With this new program, the Chamber aims to foster connections and collaborations between business women and community leaders, and provide advocacy for womens issues. A preliminary site plan for Copperwood, the senior housing development proposed for Princeton Ridge, has been unanimously approved by the Regional Planning Board. Architect and developer J. Robert Hillier, a Town Topics shareholder, was given the go-ahead to proceed with the 153-unit Bunn Drive project at a special meeting last Thursday. At a public meeting of Princeton Borough Council last week, representatives from New Jersey Transit repeatedly told members of Council that the Dinky is not threatened with elimination. Lew Goldstein, the Princeton Regional Schools (PRS) Assistant Superintendent for Human Resources, Public Information and Community Relations came very close last week to being named superintendent of the Hamilton public schools. In a closed-door session, however, Hamilton Board members opted not to take any action at a meeting last Thursday. Republican mayoral candidate Jill Jachera welcomed supporters to a campaign kickoff event last Wednesday, one day after winning the nomination for Borough mayor through a write-in campaign. Local Republicans were joined by some registered Democrats and others who are unaffiliated at the reception held at The Nassau Inn.